Back in 1985, there was a Band called Satan's Angel. It consisted of Chris Barnes (vocals), Paul Mazurkiewicz (drums), Rich Ziegler (bass) and Bob Rusay (guitar). They were a high school band and played a show in Dec. 1985, in which they did 2 cover songs, Balls to the Wall and Dethroned Emperor. At this point they were Tirant Sin. In 1986, Chris left to join Leviathon. Paul, Rich and Bob, moved up to Absolute Storage. They practiced with a couple singers, nothing worked out. Cam V. joined as 2nd guitarist and played on the 1st demo. In March 1987, Dennis John joined Tirant Sin as vocalist. 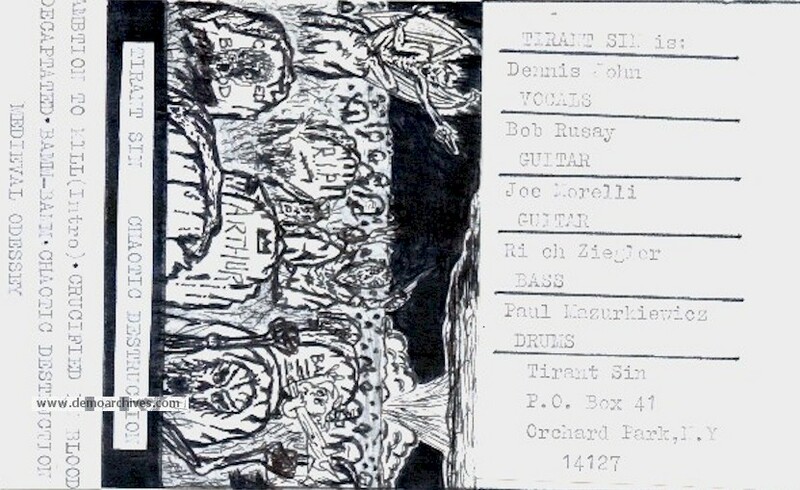 A couple months later, Tirant Sin played out their 1st show (w/ full line-up) opening for The Goo Goo Dolls. Cam left in August 1987 and was replaced by Joe Morelli on guitar. Leviathan broke up in late 1987, Chris Barnes started a band called "Sinister Mister Fugi" (SMF). That project never worked out. Since, Chris, Paul, Rich and Bob were old high school buddies. The decision was made to have Chris come back to TS. Dennis John left in late Dec. 1987. Chris re-joined in Jan. 1988. 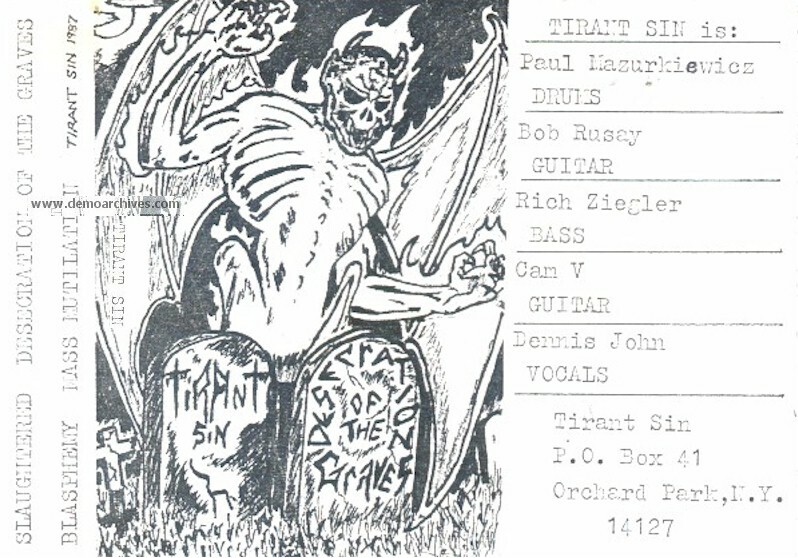 Tirant Sin played out a few shows in the first half of 1988. Then the band started to crumble. Joe left and was replaced by Mike Green (ex- Leviathan) on guitar. Then Rich left, due to personal reasons. At this point, Tirant Sin officially broke-up. In late 1988, Paul, Chris and Bob (ex-Tirant Sin) got together with Alex Webster and Jack Owen (ex-Beyond Death) and formed the now famous Death Metal Band, CANNIBAL CORPSE. In 1989, Dennis, Rich and Joe formed MAYHEMESIS with Jim Link (drums) and Phil Frost (guitar).